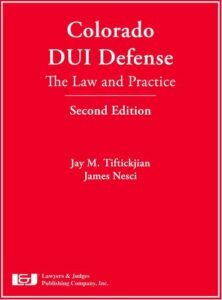 Colorado DUI Defense: The Law and Practice, 2nd Edition, 2017 - Tiftickjian Law Firm, P.C. Many practical tools and applications designed to streamline and simplify the complex DUI defense process have been developed along with this book. They are all included on a bonus DVD–so you can locate, review and print them out in a matter of seconds. The companion DVD contains NHTSA studies, articles and visual detection videos. Colorado DUI Defense: The Law and Practice, 2nd Edition, 2017 can be purchased is available at Lawyers and Judges Publishing Company.